When a client struggles with emotional triggers, finding ways to help them disrupt that automatic cycle of reactivity can be difficult. But according to Rick Hanson, PhD, there are three key practices that can help a client regain a sense of safety and calm – especially when anxiety gets triggered. He takes us through them in the video below. Check it out – it’s just four minutes. By resourcing clients with effective ways to strengthen their sense of safety and connection, we can begin to expand their toolkit for managing an emotional trigger. Now I’d like to hear from you. What have you found to be helpful in working with a client’s emotional triggers? In other words, when anxiety is triggered do not fight it! Allow it to be there by Facing it. Accept that it is there then allow your body to Float through it. Let time pass and by not fighting it will dissipate. Talk to the anxiety when Facing it , say “ Bring it On” and breathe thru it. This method is the key to recovery. When we fight it we make it worse. Everyone has some anxiety, it’s a natural reaction to fear, it’s how we think about it that prolongs it. Many have had successful recoveries from anxiety following this method! To guide them to look for the good that is also present in the situation. When we are hurting it’s hard to realise there is a hidden gift in It, for our self. Thank you for your great seminars Ruth. Over the years they have helped me immensely. You were my hidden gift when I needed extra support to under stand myself during a traumatic period if time in my life. It is also good to note that feelings come and go. They don’t stay forever. I am just amazed with the fact that there are so many writing services for students these days. Even at https://edureviewer.com/best-resume-writing-services/ you can find dozens of them and I am sure that those guys don’t review all of them so there are even more. I am enjoying Rick Hanson clip. I am new to EFT, IFT, or grounding techniques consisting in step out of your head and look around for 4-3-2-1 concrete objects placed outside. What I love the most and it is very familiar, super easy to use is the basic breathing technique : counting 1o 3 second when inhaling and counting to 5 second when exhaling. Simple, and quick fix. I love this the best. what a wonderful site. thank you for putting out such helpful material. I will definitely be coming back to sharpen my skills. My name is Patrick Martin and I am new to blogging and Pinterest. I am a mental health therapist and I started my blog to help raise mental health awareness. I appreciate the opportunity to join your group board. I would love to be invited to your group board. My website/bog is thementalhealthtoolbox.com and my pinterest profile is https://www.pinterest.com/patrickmartinlcsw. Thank you for your time. It is an amazing program, really. I am a graduate student in psychology and find an overwhelming amount of mesmerizing information here for my thesis on fear, depersonalization/trauma. Thank you very much. Very good n interesting skill. Thank you! It makes sense. The only way to know is to check back. Does anyone know when the new recording will be out? Yes, absolutely ! I can’t find other resources so this is the only place for me, but is there any other format ? I think the course is still online, but no more lectures on this topic, I believe. Are there more lectures following? Why does the DSM-5 chapter on anxiety disorders not include obsessive-compulsive disorder ? Adding Feldenkrais to one’s life will bring remarkable results. I ask them what worked for them in the past and reflect on what it was that actually helped them. Remind them that they have survived until now and done really well overall. When did “resource” become a transitive verb? In addition to what Rick Hanson said about “the feeling of being strong” is how helpful weight training has been to me as a woman in my sixties. It is hardly ever mentioned to women in general as advice. It is a real feeling of empowerment and psychological well being to be training my core and upper body to have greatly increased strength. It is hard to describe that feeling in words. But I have that as another very helpful tool in dealing with anxiety. Yes, yes, yes! I constantly tell women about the power of strength training (& yoga for strengthening, ie. Holding poses). I hope it encourages more women… like me… to empower themselves with inner psychological strength that comes from outer physical strengthening. It has been on the forefront of my mind but your story has sealed my decision. You just never know how you may impact others when you share a story. I use a Mindfulness practice. Several of my clients respond beautifully and gratefully when we practice a Loving Kindness Meditation. Followed by very brief journaling. Today I saw a young adult who I’ve been working with for at least 5 years. First I saw the client every week individually and in Group 2x a week. We used a lot of ACT & Sandtray. For the past 3 years the client will call me for a “tune up” maybe every couple of months. Today the client wanted to use coloring pages and we put on Insight Timer and listened to Kristin Neff. then moved to a small smile 😊 followed by a long gaze at me and a big sigh. The client left smiling and breathing deeply. I really like this ‘here and now’ approach to dealing the anxiety. Simple and effective. I try to understand what they’re scared of. Ex. I had a student who blamed me for things because she was scared she would fail. I told her that I’d not done what she thought and reassured her that she had studied these things and that she would be asked to do what we did in class. She would be asked ON THE TEST to do what we did in class. She would not be tricked. Thank you. Get resource hearing these reminders. I am using EFT tapping with amazing results. It is efficiently and effectively addressing decades of countless misperceptions that have caused tremendous anxiety and fear based paralysis of moving forward in many life realms. For the hypersensitive and hyper vigilant client this truly is affording them emotional freedom to live. I relate that our intuitions can instantaneously integrate and process all of our inner and outer environments, and just as instantaneously suggest options as necessary. I literally ask the question, “What should I do?”, then wait to see if my intuition comes up with options. If something occurs to me I use my gut to decide whether it is useful, or dangerous, or just ok. “Should I do this? Should I not do this? Is it ok?” All yes/no questions. “Should I worry about this? Is this OK? Should I go home now? Should I say goodbye to my host first? Etc.” Making a decision, by answering the question, makes it much easier to commit to an action that might otherwise be plagued with doubt or fear. I say that the answers may not be right, but they are best we have, and making mistakes helps our intuition do better next time. I encourage patients to let their brains do what they are best at…processing information quickly, using all data available. I have heard it said that if our brain’s ability to process information was contained in a computer lab it would be the size of the Empire State Building. Probably dated now, but maybe a quarter the size. Have a nice day! I can write to you as both the client and professional. It has helped me to have a personal understanding of what my clients are going through. It gives me an advantage to be able to choose the right words for the right situation. Being able to empathize with them helps. So they don’t feel like they are going through the pain alone. When you tell someone you empathize with them you are telling them you feel their pain. It’s as real to you as it is to them. They take great comfort in that. I write as a client rather than as a therapist. When I’m anxious I’m aware of racing heartbeat, agitation in abdomen etc and focussing on these bodily sensations increases my anxiety. Feeling feet or sitting bones connected to the earth/chair can work. Imagining a hug from my favourite person sometimes works. I’m not sure what a felt sense of safety feels like in my body so feeling into my body when I am safe would be useful. 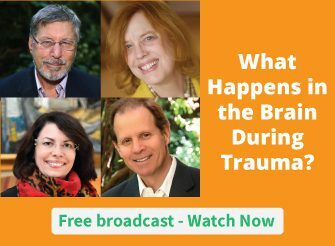 Some information which Ruth sent out recently [What happens in the brain during a potentially traumatic event] showed the the eye sends a message of threat to the brain stem. Would a strategy of looking around noticing that all is safe and calm [no threat] help to calm the system? Yes looking around would definitely help. There’s a strategy where you use your five senses and you ask yourself what do I see, what do I hear, what do I feel as in touch, what do I smell what do I taste? When I’ve had really high anxiety I’ve done that repeatedly until my system calms down. Thank you, Michelle, I’ll try that. Being able to remain calm and model deep breathing and reassuring client that anxiety will pass while commenting on the process. I want to tell you that your method is likely the most positive one for clients to benefit from. Just observing not making critical comments and middling breathing is s great way to make a clients day better. Think that it is just temporary, things will get better. Excellent focus on being present, strong, and unburdened with extra anxiety. Thank you for this gift of knowing presence. I’d like to see the model as well, Andrew. Rick, thank you for providing this and also for sharing that you have a basically anxious temperament. Hearing that actually deactivated some of the secondary responses I have to my own anxiety. What I find challenging is when I’m trying to sleep, my resources and guard are down, and anxious thoughts in the mind can take over. Loss of sleep further increases anxiety. Learning to work with this tendency and trait is my work and a big part of my own life. I would like to receive a copy of your Response Cycle printout, too.